We arrived in Debre Markos at about 8:30 pm, found a hotel room, threw our stuff in the rooms and headed back outside. Into the cool windy streets we walked, looking for familiar little faces. As we rounded a corner, a boy about 8 yrs old, carrying his box of wares, ran up to Mesfin and gave him a huge hug. They exchanged greetings, and he was then instructed to go find all of his friends and meet us for dinner at a designated spot. As we walked, we talked about how the children came to be here on the streets at night. “Business owners” go out into the countryside and look for children in need. They are promised a job and a place to live. Desperate parents agree, believing their children will be cared for and given a chance at change. What they aren’t told is that while they will have a roof over their heads, they will be made to live in a large room together with several other children and only given on average 1 meal a day. All this luxury is given to them.. IF.. .they work all night at the local bars (of which there are MANY) and sell their cigarettes, gum and tissues. We stopped to have our own dinner while the children gathered together to meet at another area restaurant. As we walked to the next stop we were surrounded by sweet little faces, ages ranging from about 6 to roughly 16. Many did not know their exact age, but did know almost exactly how long they had been on the streets. As we walked we looked at the stars, the darkness provided an amazing view into the heavens. Through interpretation of Agegnehu I showed them Orion and one of the dippers (my brother would be sad to hear of my lack of astronomical knowledge, but the kids were impressed). 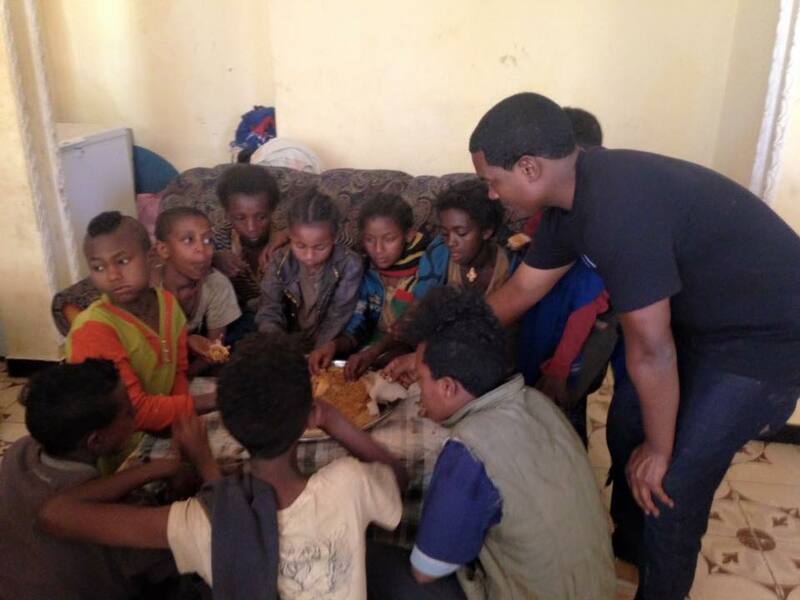 As is usual for Ethiopian children, we walked hand in hand to the restaurant that Mesfin had arranged to make them a dinner of injera (traditional Ethiopian bread) and scrambled eggs. There were about 15 – 20 boys with us at this time (roughly 20 more joined us). They all sat quietly and reserved, very well behaved and respectful. We spoke a little through translation about their lives on the streets, the length they had lived here and their desire to go to school and learn. One young man, about 14 yrs old had been to school and remembered how to count to 10 in English, they rest had had no schooling. None. Mesfin kept remarking at the addition of several children since his last visit. The children were shy, so we just allowed them to eat and enjoy a little break from their nightly work. I sat and observed. There was the boy about 11 who had significant dark circles under his eyes, and one about 7 whose smile lit up the entire room, and the one next to me with parasites in his hair and the inseam missing on his pants, while his friend next to him was wrapped in a blanket to ward off the chill because all he had was a pair of boxer like shorts. They looked tired and worn, and in serious need of a bath and a warm bed. It was over whelming. Agegnehu remarked that the children were all so well behaved and respectful of not only us, but each other. Willingly sharing, eating with manners, making sure each had enough. It was remarkable to watch. It was about 11 pm at this point and many were ready to go back to work, knowing they had a quota to reach for the night. We walked out with them, several shaking my hand with the traditional Ethiopian shoulder bump as we left, some lingering to walk with us, I so wanted to just hug them all. 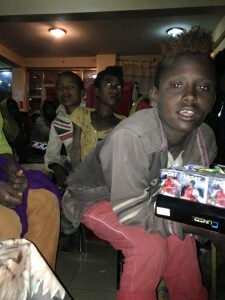 As Agegnehu, Mesfin and I walked back to the hotel some time after midnight, the streets were still buzzing with people at various bars and clubs and the children were hard at work. We were mostly silent, and then we passed the hotel where there were about 20 women standing outside… waiting to be taken inside by their next john….. Above is the recap of my second night in Ethiopia, visiting a ministry that is being started by my friend Mesfin with Endihnew Hope. 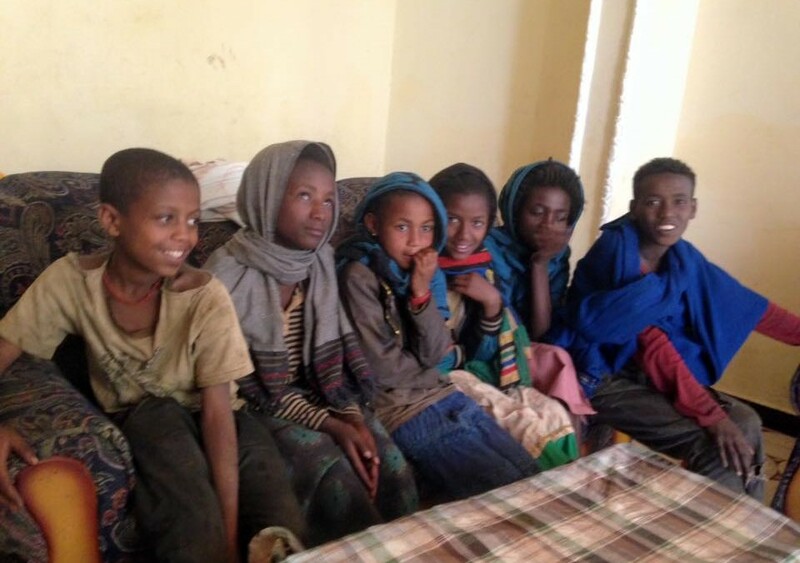 We were there on a vision trip to see if a partnership between Habesha Momma and Endihnew Hope would make sense…where together we could help to make a difference in the lives of these children. Agegnehu is my partner in the Mulat Knowledge School as well as a trusted friend, and amazing driver and Ethiopian advisor. More to come on this amazing trip..